Remap keys on GNOME3.8 using xmodmap? I want to remap some keys on my keyboard, specifically: page up key to home and page down to end. xmodmap -e "keycode  117 = End"
xmodmap -e "keycode  112 = Home"
On GNOME 3.8.4 this file takes no effect, and I have to manually: bash .xinitrc, moreover xmodmap settings are lost when I restart gnome shell (which I do sometimes because of a GNOME 3 bug), and also are lost spuriously from time to time. What is the proper way to remap keys when using GNOME 3.8? I've not tried either .xinitrc or .xsession files to do this, but I have done it using a custom launcher that gets run when I login. You can access the dialog that allows you to do this a couple of ways, I usually just launch it from the command line like so. The GUI looks like this. From here you can create your own custom startup launchers and then point them to shell scripts that contain what ever commands you need to invoke. 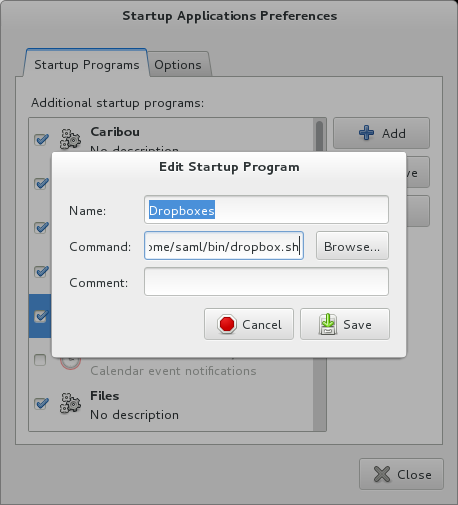 Here I've created my own Dropbox launcher script that gets executed when I log in. If on the other hand you're looking to create shortcut key combinations that will launch commands, I've successfully been using XBindKeys on GNOME 3.8.4 for this very purpose. My use has been modest but I like to create keyboard shortcuts for Nautilus to launch with certain directories opened. You'll need to first make sure the packages xbindkeys is installed. Then you'll need to run the following command, one time only, to create a template xbindkeys configuration file. With the above change made we need to kill xbindkeys if it's already running and then restart it. Now with this running any time I type Mod+Shift+Q Nautilus will open with the corresponding folder opened. I believe the ultimate issue lies with this post, titled: Quickly Setting up Awesome with Gnome. It discusses methods for getting GDM (GNOME's Display Manager) into loading these files, which to me implies that it doesn't by default. I believe gnome-session doesn't source your .xsession file by default, and the .xinit is meant to be sourced if you invoke GNOME using startx. Be sure to look through the section titled: with GDM, which shows this in more details. Unfortunately .xmodmap is not and will not be supported by Gnome 3 anymore. Users should migrate their configs to xkb. Not the answer you're looking for? Browse other questions tagged keyboard gnome3 xmodmap or ask your own question.